Lovely layered art with dramatic results. A great activity for any age group! All the materials you need are included. 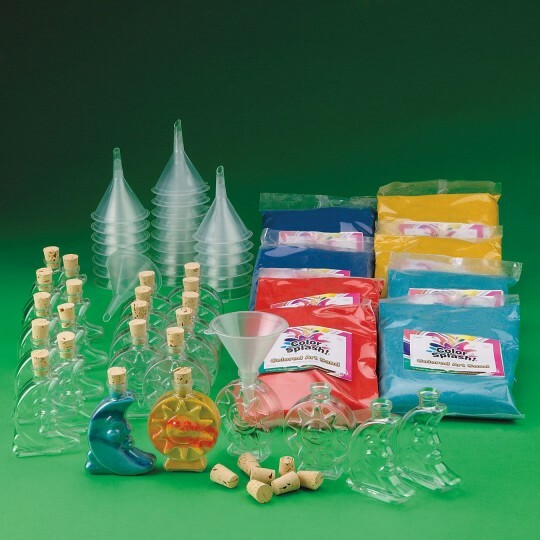 Everything you need to create 24 one-of-a-kind sand art bottles! Pour and create lovely layered art with dramatic results. A great activity for any age group! Includes 24 bottles with corks (12 each sun and moon), eight 2-lb. bags of fine sand (2 each yellow, orange, blue and light blue), 24 funnels and 1 idea guide. Bottles are 4" tall (with corks).